Happy Tuesday! I hope you had a great Labor Day weekend! Now that we are past Labor Day, I am ready to begin my Fall decorating. Day 1...The theme was, "Vintage". I shared these demitasse cups that belonged to my grandmother. I found them (again), while reorganizing my china cabinet. They are very delicate, with an iridescent finish. I am now using them for my morning tea. Day 2...The theme was, "Pattern". 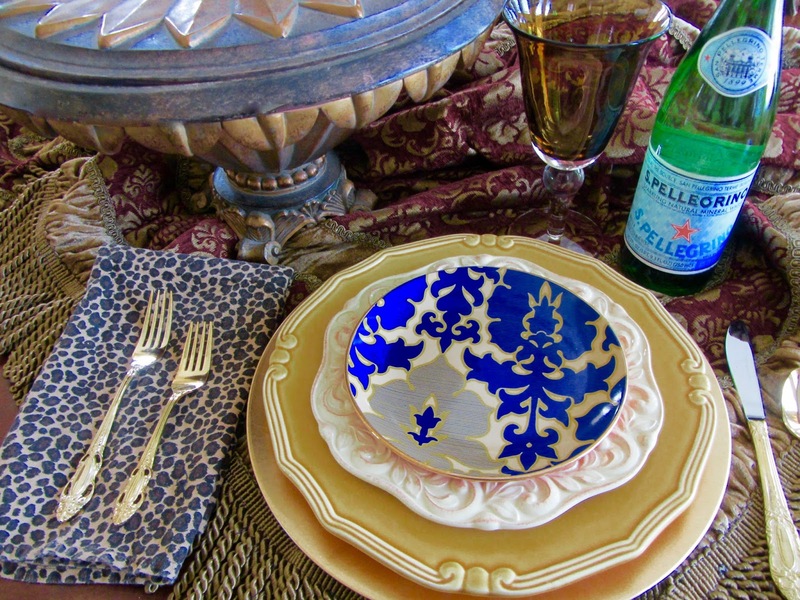 I shared a place setting using a mix of patterns and textures. 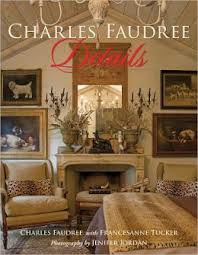 I have always loved the stylings of Charles Faudree and Ralph Lauren, when it comes to mixing patterns. As always, I began with a table cover. This one had plenty of pattern and texture. I layered it with a gold charger, a vintage Williams-Sonoma dinner plate, a heavily embellished plate, and a patterned dessert plate by Tracy Reese. I added a touch of whimsy with a leopard print napkin. The patterns are all so different; but, somehow, they still work together. Day 3...The theme was, "Red". 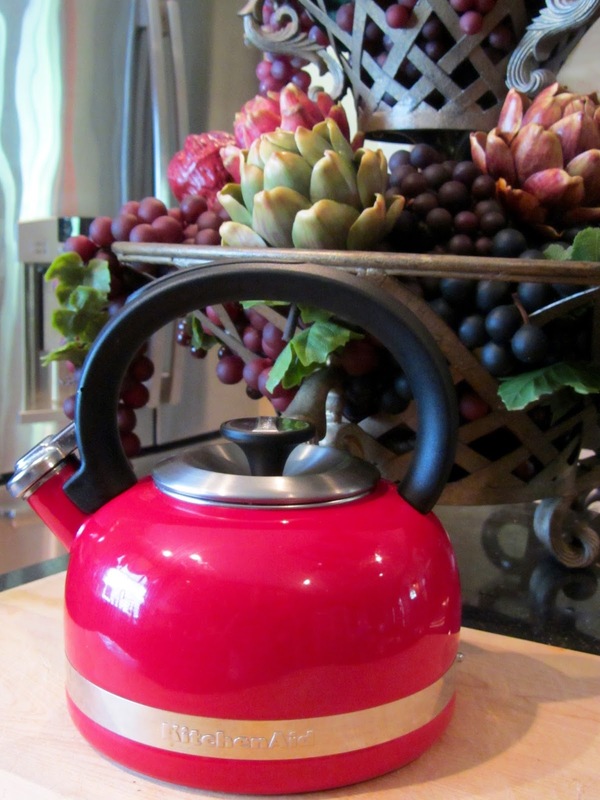 I chose our little red Kitchen Aid tea kettle, that matches our red cookware. Day 4...The theme was, "Food and Drink". 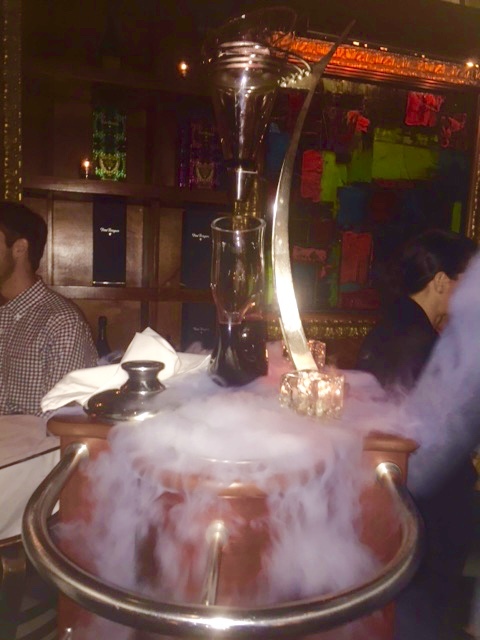 On Saturday night, we went out to dinner with two other couples, at Nick and Sam's Steakhouse, in Uptown Dallas. We had an awesome evening! 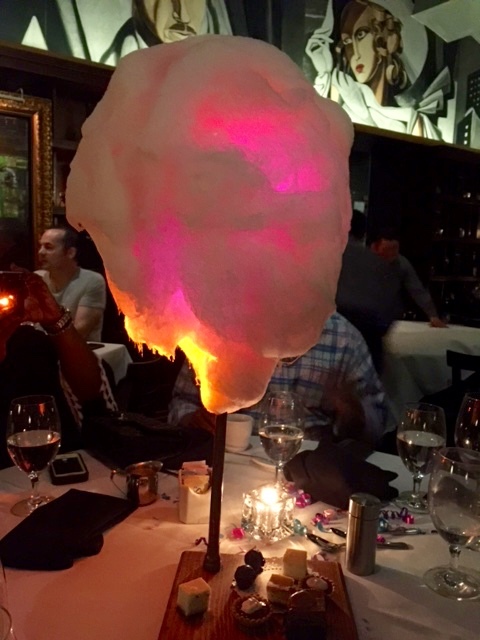 I shared a collage photo of the wine aerator that poured the wine and the illuminated cotton candy, with petit fours and truffles for dessert. The presentations were amazing! Yesterday, the theme was, "Cozy". I shared a photo of my bestie's foyer table. I think the lighting just sets the mood for a warm and cozy evening in. Finally, after an intensive search, I located my bins of Fall decor. 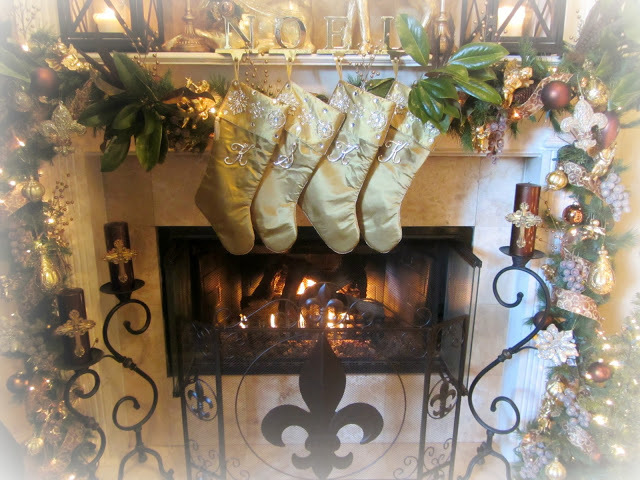 I took a break from blogging last fall and spent most of my time at our Louisiana house. So, there was not much Fall decorating going on here. I had no idea where I had stored the bins; and when I located them, I no longer cared for the decor for my interior. So, I spread everything out on the floor and created new wreaths and decor for outside. As the month goes on, I will be back to share some of what I've posted for the week on Instagram, along with my Fall decor. Thanks so much for stopping by today. If you are on Instagram, I invite you to follow me there, as well. I usually post photos everyday; and many are not seen, here, on the blog. Shenita, so much to love on your Instagram! Thanks for putting the September challenge all together, so far! Wishing you a beautiful afternoon! I am starting tomorrow....inside. Outside will wait a week or so. It is going back to the 90's here this week:( I am OVER the 90's!!! I also bought a few things to make a new Fall wreath. I love, LOVE Fall!!! Love all your pictures. I haven't started fall decorating yet but it's on my mind. I'll follow along on Instagram too! Great photos, Shenita! I'm sure you're enjoying the Instagram challenge. I really like the teacups, and I take Southern Lady magazine, too. ;) You made a lovely wreath for fall; I'm going to be making one later this week. So glad I'm not the only one who can't find my fall things! #toomanyboxes lol!! I love what you did with your wreath!! Now we need some cool weather to go with! xoxoxo! 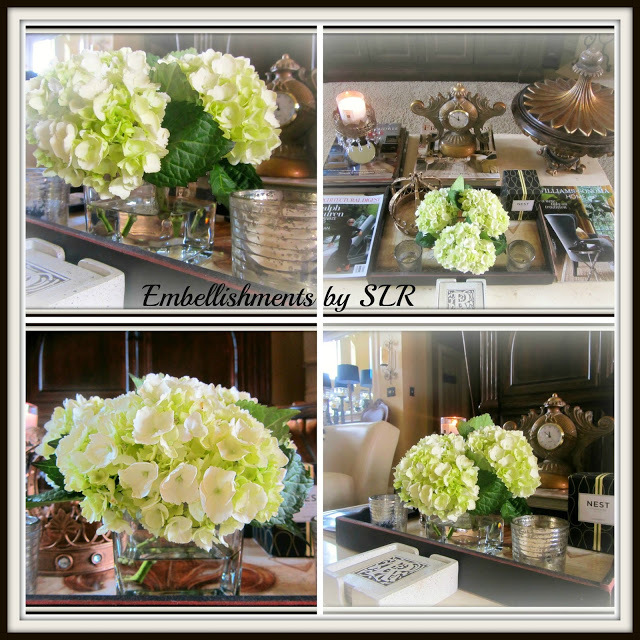 Can't wait to see your Fall decor....been a little out of sync with blogging...will be catching up soon! The September challenge sounds like lots of fun! Love every pic Shenita! 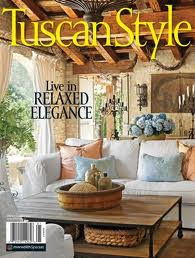 I especially love your tablescape with the blue plate and San Pellegrino bottle. The blue label picks up the blue from the plate! So lovely. I do love IG. It so easy and so interactive. Gorgeous photography for your "September ~to~ Remember", dear friend! 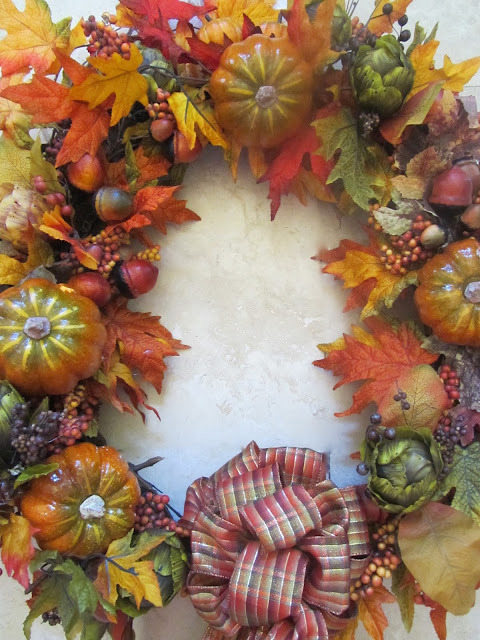 Your Fall Wreath looks fabulous! 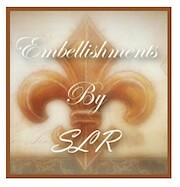 Thank you for sharing on your blog as I don't have Instagram. So beautiful Shenita. Loving the buffet. Your beautiful styles shines through everything. I never tire at looking at your wonderful decor. Such a beautiful wreath. Enjoy the week. What a great idea for a challenge on Instagram. 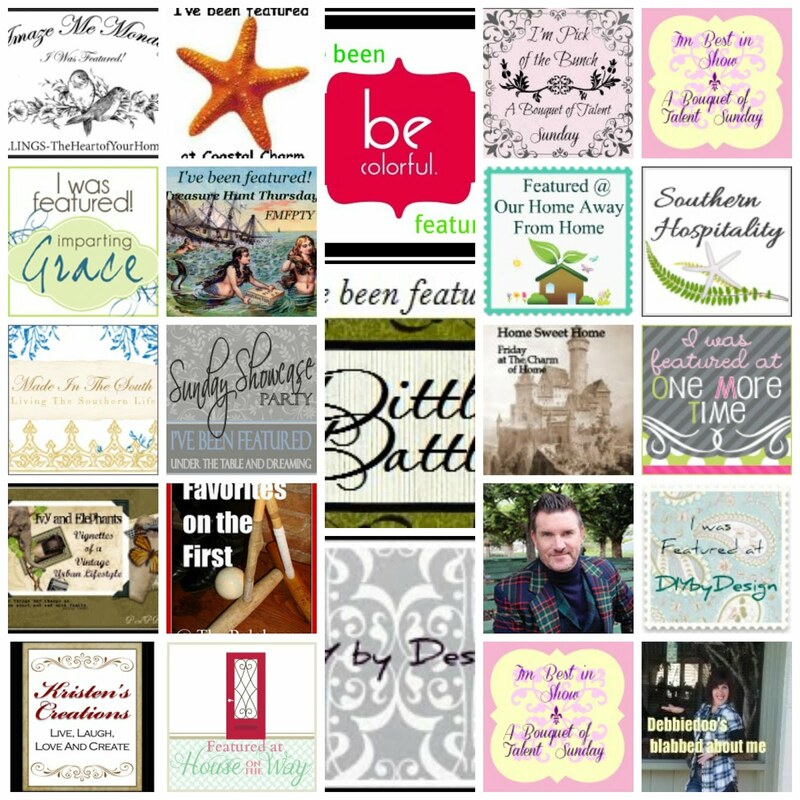 Thank you for sharing your photos on your blog and at Monday Social. I am new to Instagram and am just learning how to find my way around it. 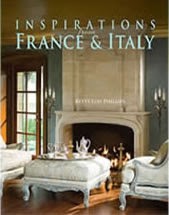 As always, everything is so elegant, classical and in such amazing tastes...love it all. Pretty 'September to remember' you shared with us, dear friend. You are a great photographer too! All your Fall décor is amazing and such an inspiration. Very elegant, which I love. I hope in another two weeks I will be able to decorate. Our guest rooms are almost ready too. Have a blessed week Shenita.